The following information was taken from A Historical Summary of the North Carolina Industrial Home for Colored Girls Or “The Efland Home” by Valerie Wade, May 2014. The North Carolina Industrial School for Colored Girls (Efland Home) was located on approximately 140 acres of farmland in Efland. Led by Charlotte Hawkins Brown, the North Carolina chapter of the National Association of Colored Women (NACW) purchased the land in 1921. The farm extended just south of the North Carolina Railroad (then called the Southern Railroad) to old Highway 10. Highway 70, which lies north of the property, was built in 1927. The geographical location of the Efland Home is as important as the building itself. 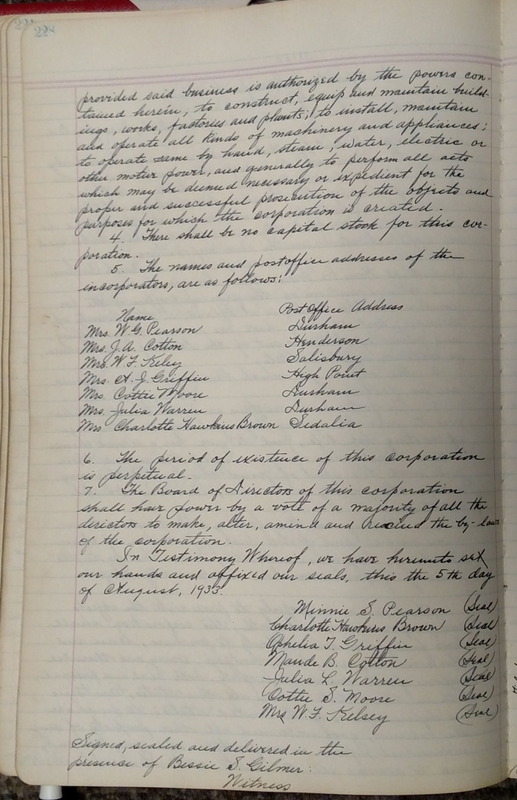 As early as 1919, the NACW attempted to work with the state government to secure a location for a reformatory for African American girls. The reformatory had to be distant enough from town to quell concerns from residents, but close enough to facilitate the transportation of students and supplies. 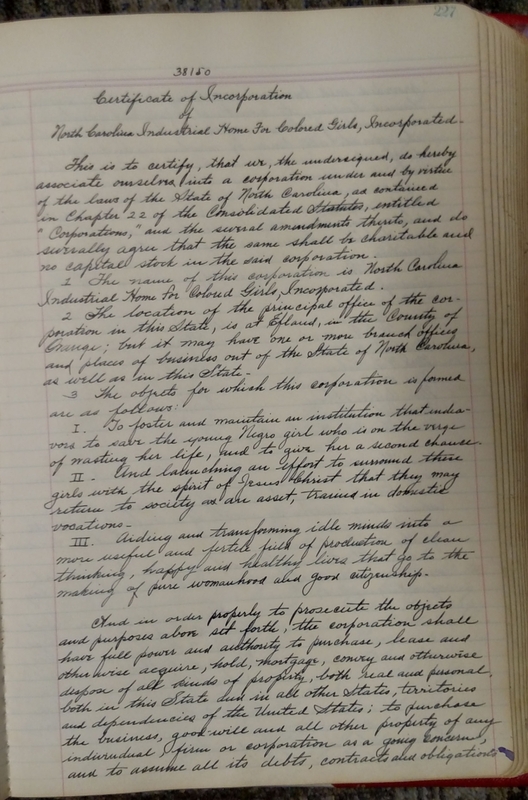 In November 1919, Charlotte Hawkins Brown wrote, “We are about to enter into a bargain for the old government barracks west of Hillsboro, containing 147 acres of land, fairly good buildings, price $31,000.” After extensive fundraising, the NACW was able to obtain a mortgage and open the reformatory. The Efland Home began operating in 1925 after the NC Federation of Colored Women's Clubs campaigned for years for the establishment of the institution. A summary of the reformatory's history may be found on pages 271-276 of Dr. Leslie Brown's book "Upbuilding Black Durham: Gender, Class, and Black Community Development in the Jim Crow South" and Chapter 3 of Dr. Susan Cahn's "Sexual Reckonings: Southern Girls in a Troubling Age." As president of the North Carolina chapters of the NACW, Charlotte Hawkins Brown, the influential North Carolina educator, was responsible for the establishment of the Efland Home. Though the reformatory struggled financially, it quickly became an essential facet of social work for poor children in the state. For years, North Carolinians of all backgrounds sent money to Brown in support of the Efland Home. Some years, the state sent the school $2,000 to assist with operations, but this was far below the appropriations for Samarcand Manor and the Stonewall Jackson School [i.e. other reformatory schools]. 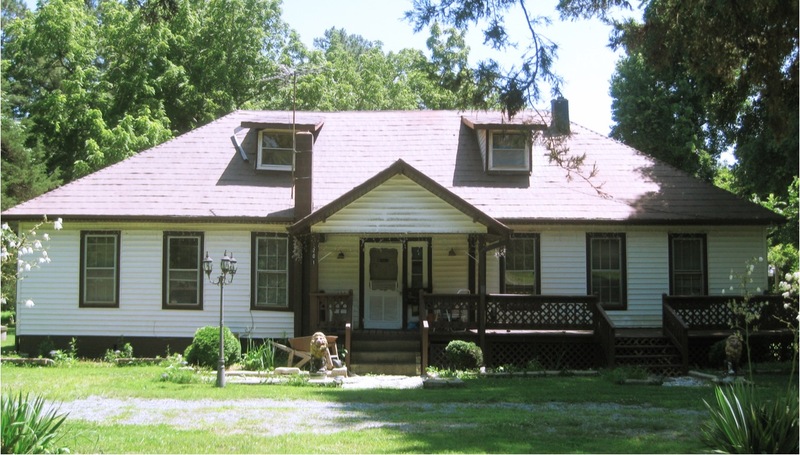 Ultimately, the Efland Home supported itself with its own farm and community donations. The girls there raised produce, cows, and chickens. They learned sewing, canning, and other skills. For Christmas and other major holidays, local NACW members rallied nearby citizens to contribute gifts, clothing, and school supplies to the girls. state would recognize the validity of the institution and consequently support it in a similar fashion as Samarcand Manor. Monetary support from the state would be more robust and consistent than donations, but it was not until about 1939 that this transition materialized. The Efland Home survived on meager resources until 1943, when it closed. In 1944, it finally received state sponsorship, and operations were moved from the overcrowded building at Efland to Rocky Mount, NC.